You may be inclined to make snap judgments about Dear White People’s intentions based on the title alone. Though such snap judgments are obviously the film’s actual intent—a little egging-on never hurt anyone—it has no desire to condemn its viewers, white or not. Instead, Dear White People wants to upset you: to turn your judgments on their heads; prove your judgments wrong; confuse your preconceptions. This is because its central subject matter—contemporary race relations as filtered through young black experiences—is intrinsically upsetting. The results aren’t incendiary, per se, and rightfully so; there seems little forward progress in burning everything down. Interpreting Dear White People as anything other than a sincere invitation to peer through its personal, cultural lenses is a mistake, because what the film does so soberly is shine a caustic light on the most infuriating elements of current discussions about racism without engaging too blindly in that rage. 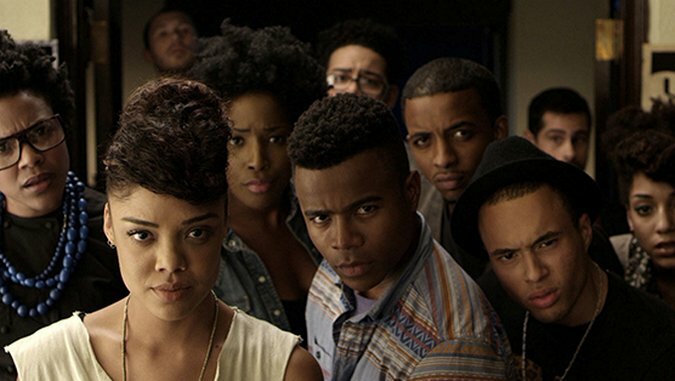 Dear White People will boil your blood, but it will make you laugh, too. If nothing else, though, it might break your heart. The film begins where it ends, with a news report about an “African-American-themed” Halloween party, thrown on the fictional Winchester University’s prestigious Ivy League campus, a campus wherein a non-white face is a relative obscurity. After this intro, Dear White People leaps backward five weeks to assemble the events, piece by piece, that ultimately led to the tasteless soirée. Simien chiefly balances his narrative on the shoulders of four black students each starkly aware of their racial differences at their alma mater—Lionel Higgins (Tyler James Williams), Samantha White (Tessa Thompson), Troy Fairbanks (Brandon P. Bell), and Coco (Teyonah Parris). These four students feel, represented together, both like fractured shards of Simien’s psyche, disparate pieces of himself that he’s carefully, lovingly molded into fully fledged human beings on the screen, and like separate entities completely: they want to be accepted, they want to be seen, they want to be heard, and they want to be themselves. But that entails figuring out who the hell they are as individuals, a common thread which drives Dear White People’s more so than the looming vulgarities of the climax. Simien wants to guide his audience through the many and sundry complications of being black in a society shaped and curated by whites, but he also wants to foster inclusivity and unity via his uniquely modern brand of cinema (a jambalaya of greatness cultivated through a fondness for Stanley Kubrick, Robert Altman, Wes Anderson, Woody Allen, Howard Hawks, and Spike Lee, among others). Like his cinematic heroes, Simien has a playfully sly sense of humor and a steady hand for satire, weaving both qualities throughout his debut feature with deft self-assurance. Dear White People is a peeved film, a touching film, a thoughtful film, and a funny film all at the same time, but structurally it’s an exercise in developing tension. That’s no small feat given how the film starts. We know Dear White People is building toward a racially charged finale from its very first frames, and we know that every step Simien and his cast take together is a step closer to an appalling display of overt, casual racism. Along the way, we’re treated to sermons about the death of racism in post-Obama America, none of which go down particularly well; sure, our president is black, and sure, white folks take to black media like fish to water. That just makes the sight of white kids happily done up in blackface even more grotesque. But while Dear White People anchors its perspective in the struggles of its black leads, it argues that racism is a universal issue—or that, at least, dealing with the implications of racism, rooting it out at its source, is a personal task for every single human being to undertake. Who hasn’t, at one point or another, felt like they didn’t fit in with their peers? Who doesn’t feel the tug of social pressure when they’re in school? These aren’t questions about racism, but they do inch us collectively closer to targeting the very deep-seated core of what it is that still makes racism so prevalent today. Simien stumbles in the third act thanks to an amalgam of plot complications (a stroke of simplicity could have smoothed over Dear White People’s landing), but maybe a diluted ending would have glossed over the truth at the film’s core: that race politics are more complex than pretty much any one of us realizes. The film is as much about “blackness” as it is about the search for self, and in maintaining that equilibrium it shatters barriers we never even knew existed. None of this is to say that Dear White People doesn’t focus foremost on racial concerns in 2014—its release is all too timely—but Simien realizes that this is a dialogue that affects us all, and his work is calibrated with that idea held firmly in mind.